There were 21 Spartans winning three golds, two silvers and lots of new personal bests (PB) at Sunday’s Hatfield Five. The race included the Hertfordshire five mile championship for veteran runners. BRIAN WHITE won GOLD for men aged 60 plus with a fantastic 31 minutes 21 seconds. He says he has room for improvement! This year he has won County Gold at 5K, 5 miles, 10 miles and half marathon but only silver in the 10K! Then BARRY OSBORNE made it a Spartan one two by taking SILVER in the same category with 32:37. ALISON WOOD won GOLD for women 45 to 54 with 33 minutes 15 seconds and IRIS HORNSEY GOLD for 75 plus with 49:14. JULIE SIMMONS took the SILVER for women 55 plus with 39:22. There were new personal bests from SIMON JACKSON fourth 40 plus in 28:00; STEVE GREEN 31:31; ISABEL GREEN 36:34; and KAREN BROOM 46:49. SUZY HAWKINS and CAROL PAUL just missed out on a medal. Suzy was fourth 35 plus in 33:48 and Carol fourth 55 plus with 43:34. LEE PICKERSGILL and SIMON SYPULA ran their first ever five mile races in 39:10 and 40:11 respectively. 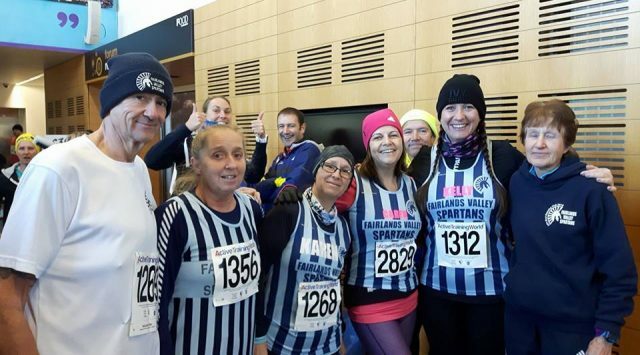 Other Spartans included JOHN HARRIS 32:56; STUART ARCHER 33:18; ANDY JAY 38:13; STEPHANIE MAYFIELD 43:59; SHARON CROWLEY 44:28; KELLY CHAPMAN 1:01:16; CAREN THAIN 1:01:16 and TREVOR BROOM 1:01:41. Fairlands Valley Spartans held their AGM on Friday. SOPHIE COWAN is the new chair and BEV HARLOW president. CLAIRE PULLEN is secretary and ISSY GREEN continues as treasurer. KIERAN FEETHAM is the new head coach with NIKKI WILBY and PETE SMITH as the two assistant head coaches. JOHN NELMS takes over as membership secretary. Women and men of all abilities are very welcome. Fairlands Valley Spartans offer training sessions on five days every week including free to members coached sessions at Ridlins track on Saturday mornings. The club is affiliated to United Kingdom Athletics giving access to hundreds of events and competitions every year. The first five mile race of the weekend was the Wolverton Five at Milton Keynes on Saturday. CRAIG HALSEY cut his personal best by over a minute to finish tenth in 26 minutes 25 seconds. Yuko Gordon won her age category with 36:48. Kerstin Weiner has now run a personal best (PB) at every standard road race distance this year. She finished with ANDY PRIOR in 40:53. PAUL HOLGATE’s 47.30 shows he is continually improving after his accident. The Wolverton Five is held on a Saturday afternoon, 250 participants, relatively flat course which is fast as long as the wind doesn’t whip off the lakes – it was a bit cold though!! It was bright and breezy for Sunday’s Bass Belle ten mile race at Bassingbourn. Spartan GRANT RAMSAY beat the hour and was third out of the 370 runners in 59 minutes 6 seconds. TOM SAUKA was next in with 1:11:52. The fastest female from Fairlands was RUTH REILLY in 1:13:34 with MADDIE PRITCHARD not far behind in 1:15:57. Eleven other Spartan women took part. They were KAREN ELLIS 1:22:02; CLAIRE EMMERSON in a new personal best of 1:22:33; HAZEL SMITH running her first ten mile race in 1:23:24; JENNY GARRETT in a new PB of 1:26:36; JACKIE DOWNES cutting her PB at the Great South Run by 8 minutes to 1:27:28; JULIE SHADBOLT 1:28:14; ERICA GRAYSON 1:28:27; SUE HAMER in 1:42:03 and JAN FRY in 1:44:19. NEIL ROBINSON finished in 1:25:06; STEVE PIKE in 1:27:19 and PAUL HOLGATE in 1 hour 41 minutes 38 seconds. Mild and still conditions encouraged some great runs in Hyde Park on Friday. MADDIE PRITCHARD recorded 21 minutes 17 seconds for the Serpentine 5K. There were 249 runners in the lunch-time event. ROGER BIGGS ran the Owler Marathon on Sunday. This was a multi terrain marathon from Ashford Athletics Track with two laps set in the surroundings of Conningbrook Lakes Country Park, and the quiet roads of Brook. A combination of quiet roads, tracks and muddy paths. Roger Biggs completed the two laps in 5:46:17. It was a quiet week for parkruns with a number of Spartans lining up in the Bass Belle 10 and Hatfield 5 races the following day. The quickest Spartan parkrunner of the week was ASHLEY SCHOENWETTER who was first woman to finish at Stevenage in a new course PB of 20 mins 34 secs. JO BOWDERY also finished in the top 10 running with her dog in 24:31. DAVID SCOTT was first Spartan man to finish in 24:32 with CHRIS HOLLAND also running sub-25 despite stopping to help a young lad who was in a collision with a cyclist, the lad then bravely continuing to finish in front of Chris! VERITY FISHER was second woman at Torbay Velopark in a time of 23:18. Last week’s furthest away parkrunner got even further. Now in New Zealand PENNY SCHENKEL ran the Hagley Parkrun, Christchurch 11,763 kilometres away in 27 minutes 6 seconds. Herts Sports Partnership Awards at Hatfield on Tuesday 28th November. 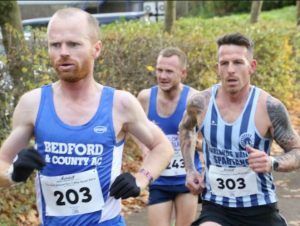 Bedford Harriers Half Marathon on Sunday 3rd December. Spartans Christmas Party with an 80s theme on Friday 8th December. Festive Five at Welwyn Garden City on Sunday 10th December. Cross Country League at Willian on Sunday 17th December. Witham Five on Tuesday 26th December. Buntingford Year End 10 on Sunday 31st December. New Year 10K in Hyde Park on Monday 1st January 2018. County Cross Country Championships at Cassiobury Park on Sunday 7th January. Cross Country League at Watford on Sunday 14th January. Fred Hughes 10 miles including county championships at St. Albans on Sunday 21st January. Watford Half Marathon inc. veteran championships on Sunday 4th February. Orion 15 at Chingford (Epping Forest) on Saturday 24th March.